Take Hwy 17 North via the Crosstown. Follow Hwy 17 North towards Mt. Pleasant. Continue over the Ravenel Bridge. Merge right onto W. Coleman Blvd, towards Sullivan's Island. 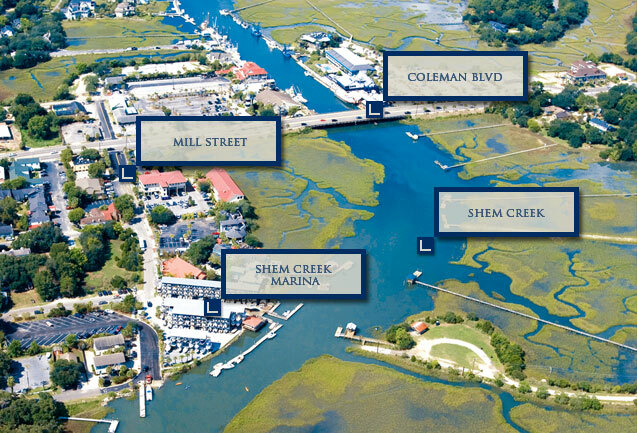 Cross over the Shem Creek Bridge and turn left at the first traffic light onto Mill St.
Shem Creek Marina is located at 526 Mill St.
Take Hwy 17 South towards Charleston. Take the I-526 East exit. Continue on I-526 until it ends in Mt. Pleasant. Merge directly onto Chuck Dawley Blvd. Merge right onto Coleman Blvd. From I-26 East merge onto Hwy 17 North via exit 220 B towards Mt. Pleasant/Georgetown. Cross the Ravenel Bridge (Hwy 17) to Mt. Pleasant. Merge onto W. Coleman Blvd., towards Sullivan's Island.